I know you don’t want to disappoint Snolon. Come learn about microcontrollers at our Intro to Arduino Workshop on Tuesday, February 7th at 7 PM. The workshop will cover the basics of microcontrollers through the Arduino platform. 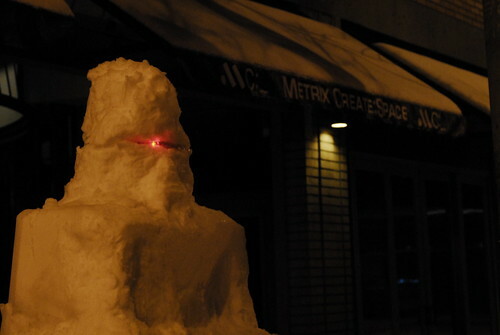 You can learn to make your own happy Snowlon, or any number of other fun, useful, quirky projects. The Arduino platform is versatile and lends itself to many applications, both small and large in scale. In the workshop we will go over both the hardware involved in an Arduino board and peripheral electronics as well as the software and programming to make it all work. No previous knowledge or experience in either electronics or programming necessary. The workshop fee ($60) includes two and a half hours of instruction, an Arduino board, and electronic components for the hands-on exercises. All you need to bring is a computer and your exciting project ideas. To reserve your spot call Metrix Create: Space or stop by our shop on Broadway.